There are 2 brand new definitive SMC guidebooks to Skye now available including Skye The Cuillin written by Skye Guides director Mike Lates. SKYE THE CUILLIN Signed copies now available. 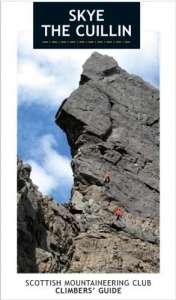 This is the Scottish Mountaineering Club’s definitive guidebook to the Cuillin, both Black and Red. 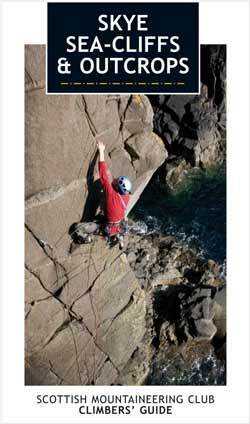 It is written for walkers, scramblers and climbers. Full page colour photographs showing approaches and descents are backed up with clear concise descriptions. There is extensive advice on weather, equipment, safety and amenities. The fascinating story of Cuillin history and geology is told and the whole book contains over 100 colour photographs. 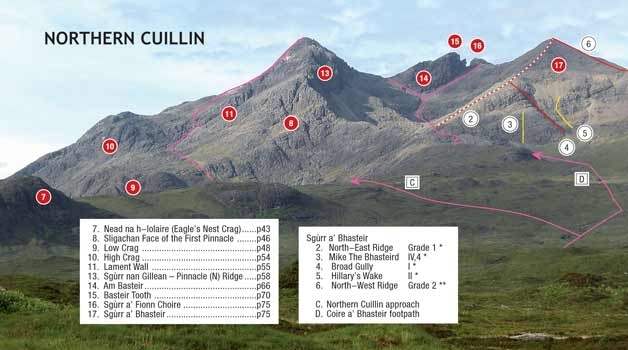 Mike has done an outstanding job demystifying the Cuillin massif. Route descriptions are clear, and Mike goes out of his way to help the reader. No longer do the Cuillin feel quite so terra incognita. SKYE SEACLIFFS AND OUTCROPS also now available. The sister-book to Skye the Cuillin has just been printed (January 2012). It covers climbing across the whole of the rest of Skye and the neighbouring island of Raasay. The books were due to be one volume but so many new climbs have been done since the last edition that it became too large.